This recipe is easy as can be and the results will amaze you–delicious, garlicky and perfectly crispy baked sweet potato chips from your oven! You will never buy these at the store ever again. A couple of notes first. It’s really important to use the center rack of your oven – you don’t want your chips to burn, and the bottom rack may be too close to the heat. Second, use a mandoline slicer or food processor to slice your sweet potato because if the slices aren’t uniform in size, you’ll have some start to burn while others are still soft. Otherwise you’re good to go, and everyone will love this recipe. 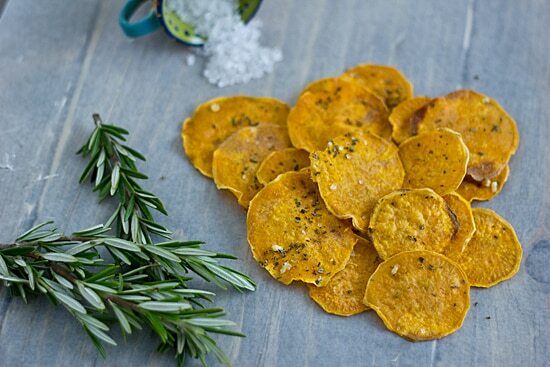 Crispy baked sweet potato chips brushed with garlic-infused olive oil and sprinkled with fresh rosemary and sea salt. Preheat oven to 400 degrees. Position rack in the center of oven. Whisk together olive oil and garlic in a small bowl. Brush two baking sheets with half of oil mixture. Place potato slices on sheets in a single layer and brush tops with remaining oil. Sprinkle with rosemary and salt. Place baking sheets on center oven rack. Bake for approximately 10 minutes or until edges begin to curl and brown. (Note that the baking time depends on the thickness of the chips–even a slight difference in thickness can impact the time, so keep an eye on them!) Allow chips to cool completely on baking sheets. Make the garlic oil mixture before you start slicing the potato for a more intense garlic flavor. Garden Update | Now I know why you start legumes outside... What I Ate (and did) This Week | Road Trip! Hi!! i cant wait to try this out. may i know if the potato skin was left on or peeled? Why can’t I print when I hit print? Sorry it’s not working for you! I just tested the print button and it works fine. I’d check your browser settings – I’m thinking pop-up blockers and things like that might interfere with the print function. Or you could try using a totally different browser.